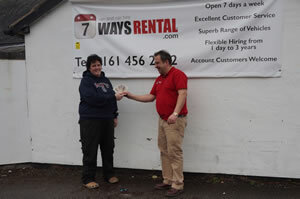 This quarter's £100 prize was won by Sally Brown From Trinity Management Systems Ltd.
"Hired a transit van to move furniture. 7 Ways were fantastic as they accommodated me picking up the van on a Sunday morning ensuring that this hire was totally cost effective. Not like other van hire places were you have to take the van over the whole weekend. Thank you for the fantastic service. Hope you got your breakfast Andrew?" Our next prize draw will be completed on the 5th April 2015.